The Doctor acorn is the only one in the forest in this fun skill game and some birdies just called in sick and he needs to go check them out but you will be playing an important part in this awesome levels because you will be clearing the way for the doctor so he can reach them in time. Keep trying your best to activate the switches and also you need to avoid the spikes as they will put a dent in the doctor if he hits them. You will need to think your way through in order to make sure that you activate the switches in time and in the right order. 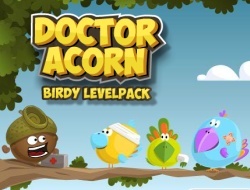 Doctor Acorn Birdy Levels Pack 0.00 between 0 and 10 based on 0 votes.